Southwestern New Mexico, United States, is the state's most diverse region, although not its most populous. It includes Las Cruces, second largest city in the state; the Gila Wilderness, a vast roadless area popular with hikers; and a great deal of desolate territory near the border with Mexico. South, by the Mexican border and Texas state line. Note, however, that the area around Albuquerque and extending as far south as Socorro is considered to be a separate region, Central New Mexico, rather than part of this one. This is a geographically complex region that has a great deal in common with the basin-and-range country of Arizona and Nevada from a geological standpoint. Much of it is mountainous, with some comparatively recent volcanism in a few places. The combination of rugged terrain and low rainfall has limited the number and size of cities and towns here, except in the valley of the Rio Grande, which contains most of the region's population, including the comparatively large (population about 75,000) community of Las Cruces. English, although Spanish is the first language of some residents of the region. The presence of New Mexico State University in Las Cruces, with a reasonable number of international students, means that your chances of running into people who speak other major European and Asian languages are better here than in some regions of the state. The only airport in this region with scheduled commercial service is at Silver City, with extremely limited commuter service to Albuquerque. The nearest significant airports are in Albuquerque and El Paso, Texas. Interstate highway 25 passes through the region north-south from Albuquerque to its junction with I-10 at Las Cruces. Bus lines follow this route, with some digressions into small towns in the region, but service is generally fairly limited. Amtrak's Los Angeles - New Orleans Sunset Limited  route passes through the region, stopping in Deming and Lordsburg. Although the region has a long border with Mexico, (legal!) entry from Mexico is only possible at a few locations. The entries in the region itself are crossings at Santa Teresa  in Doña Ana county and at Columbus  in Luna county. Much more traffic enters from Juarez near El Paso  and heads north from there. There are checkpoints along the major arteries from El Paso/Las Cruces where the Border Patrol may check for illegal immigrants, smuggled goods, etc. They generally don't hassle travelers on routine business; don't break any laws and you won't have any problems there. Drive; there is little public transportation in the region except in Las Cruces. Most Interstate, US and state highways are routinely driveable year-round by all ordinary vehicles. However, SR 152, one of the main routes into Silver City and the attractive mountains around it, has a number of hairpin curves that are enervating for drivers of large recreational vehicles. If you're in an RV and bound for Silver, consider getting there via a different route. Follow I-25 to Socorro on the southern edge of the central region, and beyond to the San Antonio exit. 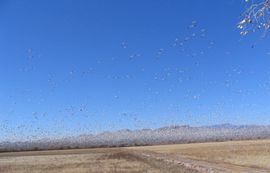 At San Antonio, turn south (right) on NM SR 1 and proceed to the Bosque del Apache National Wildlife Refuge. Do this immediately after dawn, as the birdwatching is good first thing in the morning. Spend an hour or two on the loop road (fee $3/vehicle); have binoculars handy. Continue south on NM SR 1 to a side road to Fort Craig National Historic Site. This ruin from frontier days will give you a sense of the desolate life experienced by the 19th-century soldiers in the (then) New Mexico Territory. There is a short interpretive trail. Return to SR 1 and continue south to rejoin I-25 and on to Truth or Consequences, locally called "T or C". There is a small museum (Geronimo Springs Museum) in T or C that explains how the town got its curious name, with some other cultural artifacts. You can either stop here (M-S 9-5, $3 admission), catch a quick dip in one of the town's hot springs, or simply keep going south -- T or C isn't a great tourist site. En route to Las Cruces, pause in Hatch to pick up some chile (see under "Eat"). If you have time, before getting to Las Cruces, digress to Fort Selden State Monument, another site preserving a 19th-century fort. Open 9-5, closed Tuesdays and holidays; $3 admission. If you've had your fill of forts but still have time on your hands, consider instead leaving I-25 at Dona Ana to cross the Rio and drive south to Las Cruces along local roads through pecan orchards. Either way, spend the night in Las Cruces. Spend the next day in Las Cruces' several small museums, at New Mexico State University, or hiking in the Organ Mountains east of town. If you're ambitious, head over to White Sands National Monument in the southeast region, which is fairly close to Las Cruces. Either way, overnight in Cruces again. When you're ready to move on, either leave the region via I-10 eastbound to El Paso or westbound to Arizona, or return to Albuquerque. Take US 60 west to Magdalena, an Old West town famous as the end of a famous cattle drive from Arizona. West of Magdalena is the striking Very Large Array , radio astronomy telescopes spread across this broad valley on railroad tracks. Visitor center open 7 days, no charge. 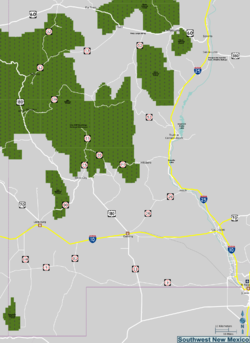 At Datil, take NM SR 12 southwest into The Gila and Catron County [] (New Mexico's largest by area). (Gilascapes , by a local resident, is full of updated information on this area of southwestern NM.) You'll cross the Continental Divide halfway between Datil and Reserve, which is the Catron County seat. A few miles west of Reserve, turn south on US 180 through a forested area with great views of the mountains. At Alma is the road east to the old mining town of Mogollon  (trailers not advised, nighttime travel discouraged). Mogollon is lively on summer weekends, quiet at other times. Just south of Alma is Glenwood, a peaceful town with several motels and restaurants. A road leaves here for the nearby Catwalk [], in a narrow canyon above a cool stream; it's a spectacular place. (Be cautious of flash floods here during the summer rainy season.) South of Glenwood along US 180 is Leopold Vista, an expansive viewpoint on the west side of the highway. Farther south of Glenwood, you can turn west onto NM SR 78 (watch for the sign!) which leads past the tiny town of Mule Creek into Safford and on to Tucson and Phoenix, Arizona. (Long vehicles not advised for 20 miles or so west of Mule Creek.) Or, stay on US 180 to Silver City. From Silver City, you can go south to I-10, Las Cruces, El Paso, and beyond -- north to Gila Cliff Dwellings National Monument  -- or east along the windy and slow NM SR 152 to the almost-ghost towns of Kingston and Hillsboro, then back to I-25 and north to Socorro. The Gila Wilderness, near Silver City, is a great place for hiking and backpacking. So are the Organ Mountains, near Las Cruces. Likewise the Gila Cliff Dwellings National Monument , north of Silver City. Open year round for day use; fee $3/day for individuals, $10/day for vehicles, Park Pass applies. A pleasant short trail (day use only) leads to interesting archaeological sites. Hot springs in the backcountry are reachable via other trails. Camping is available at Gila National Forest campgrounds nearby. For the less ambitious hiker, El Morro National Monument , on the north edge of the region off NM 53, offers short hikes to a site of considerable historical and archaeological interest. Fee $3/day (Park Pass applies); there is a small, decidedly primitive campground. just south of Lordsburg is a curious ghost town with weekend tours with the family that owns it. Shakespeare  is one of those off the wall places worth a glance. City of Rocks State Park, off SR 61 south of Silver City, has more hiking, through rock formations similar to those of the better-known (and more extensive) Chiricahua National Monument in Arizona. Small fee. Rock Hound State Park, near Deming via SR 11, is that rarity, a state park where you are encouraged to remove parts of the park -- specifically, samples of the several unusual-but-not-precious minerals found there. Fee $4/vehicle; each visitor may remove up to 15 pounds of rock. Best at times other than summer, when it's beastly hot. San Francisco Hot Springs on the San Francisco River North of Silver City. Wild hot springs located in a designated day use only Forestry area. The springs are all underwater, lining the sides and bottom of the San Francisco River. Some people have stacked small rocks to form small pools where warm water can collect along the shores of the River. Reaching the springs requires a hike of a mile or two, and the trail often disappears along the way. Caution: dangerously pathogenic amoebae have been found in these wild springs, and in fact have caused a death or two. Make sure not to get spring water in your nose here (good advice at any "wild" hot spring). Faywood Hot Springs near City of Rocks. Lightly developed. Closed in 2008, following the death of the owner. The late owner's wife has listed Faywood Hot Springs for sale. There are some other "wild" springs around the Gila Wilderness. Go exploring, and if you want some tips, a useful guidebook is Craig Martin's "Enchanted Waters: A Guide to New Mexico's Hot Springs," ISBN 0-87108-891-6. Note that this book is getting somewhat dated (1998), and ownership of developed springs, as well as access to back country ones, may have changed; inquire locally. Las Cruces is the only community in the region with a significant number and variety of restaurants (although Silver City also has a few), but there's one seasonal alternative that's not to be missed. The small town of Hatch, about 40 miles north of Las Cruces, is the chile-pepper capital of the United States, if not the world. Great fields of chiles surround the town, which becomes a major center of chile commerce in late summer and early fall, with a "Chile Festival"  in early September. The tiny town can swell in size by a factor of ten or more (2,000 up to 30,000!) at Festival time. If in the vicinity then, definitely go to the Festival and see how much spice you can handle. Shops in Hatch have chile paraphernalia at other times of the year. Las Cruces has some night life, particularly around New Mexico State University; see separate article. Otherwise this is a rural region with little in the line of watering holes. El Paso, Texas is large enough to have significant night life and is not too far from Las Cruces. This is not a high-crime area, with possible exceptions for Las Cruces and along the border. All of New Mexico has trouble with drunk drivers, but this region has perhaps fewer problems than some others, with one notable, localized, seasonal exception. Every fall, when students return to New Mexico State University, there are misfortunes when incoming students who are underage for drinking in the United States decide to take advantage of the lower drinking age in Mexico, make pilgrimages to nearby Juarez to indulge, and have alcohol-related accidents coming home. Be wary if driving on I-25 near Las Cruces, and on streets in the city itself, in the wee small hours of this time of year. Otherwise there are no unusual driving hazards apart from reduced visibility due to dust storms on the bleak stretch of I-10 between Las Cruces and the Arizona state line. Most other weather-related hazards here have to do with sun and heat. When hiking or doing other outdoor recreation, take extra water (and drink it), use sunscreen, and wear a cap or hat, preferably one with a full brim. If driving, have water in the car, particularly if your vehicle is prone to overheating. You may be a long way from help if your engine overheats (or if you do yourself), and cellular phone coverage in the region is spotty. When you're in the remote southwestern regions of the Gila, there can be long distances between gas stations and other visitor services, so plan ahead! Gilascapes  has detailed information on communities and services. This page was last edited on 27 February 2018, at 10:24.